Steam and Android versions of Shoujo City 3D are updated to version 0.8.11. All updates to iOS version are delayed for an unknown period of time, since the App Store rejects updates to the game since October 23. This is a very small technical update to remove temporary objects and decorations for two October events (Halloween and water gun mini-game). Next major update will be a new Akihabara map, but due to complexity and size of the area it will take a few months as yet to prepare all required assets. That’s why, until Akihabara map is ready for release, next few updates most probably will be relatively small additions. Water gun mini-game is moved to a new permanent place in the Summer Town map. New clothes: tall boots (fashion store), miko dress (Shinto shrine shop). Walking in shallow water now has a separate sound. The mechanic of increasing relationship score to unlock girlfriend’s equipment slots is removed. Why is the lock on girlfriend’s clothes removed ? Because I’m not sure if it was really necessary. Such small details will change all the time until the game is finalized, I think. 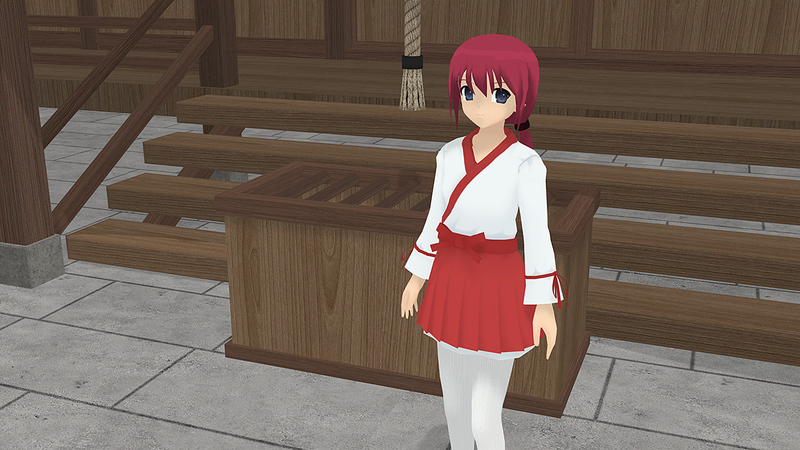 The miko dress is sold in the shrine shop, and boots are sold in the clothes store (school map). If that’s what you are asking about. are you going to make a second floor in the school building? C’est quoi le prochain mise à jour de le jeu demo ?? Demo version will be updated when there is some new content for school and apartment maps. Right now there isn’t much.